Rickey and his manager have been steadily piecing together all aspects of the upcoming Official Rickey Henderson "RH24" Fan Club. After holding a contest on Facebook asking for logo ideas to be submitted, the two winners were announced this morning. 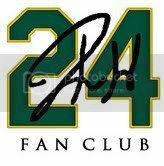 The first design, which will be used as the official fan club logo, was designed by John Wong, a fellow Rickey fan and collector. A simple yet personalized design, I think it looks great! Although it features the classic Oakland A's green & gold, it's basic enough that fans of all of Rickey's teams are able to relate to it. The next logo, designed by Ryan Lundy (owner of the craziest collection of Rickey cards serial numbered beginning in 24 you'll ever see), will be used on club letterhead and correspondence. As an A's fan myself, I love the use of the elephant, and it represents the team that Rickey is most widely recognized with. Overall, I'm real happy with the designs (I wished I had the skills to submit one of my own), and can't wait until more details of the fan club are released. Once they are, I'll post them as soon as I hear anything. 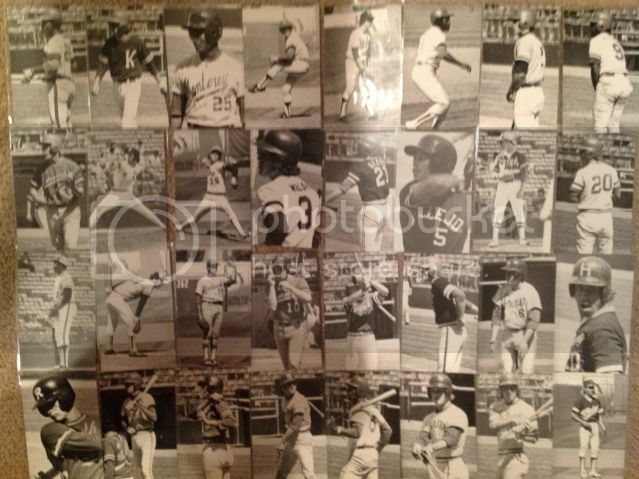 The Topps Vault frequently sells negatives, proofs, unused pictures and other card related items in their eBay store. While these items would be fun (yet expensive) additions to the collection, they are definitely not something that I just have to have. Yet, every once in awhile, I think about what it would be like not to have a budget. 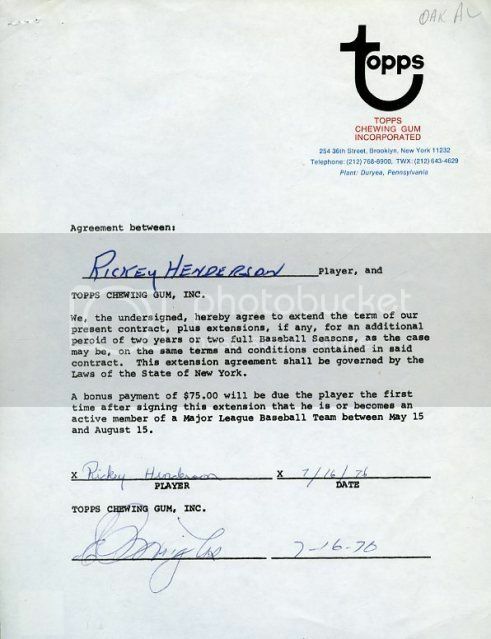 A recent auction featured Rickey's first Topps contract, signed in 1976 as 17-year-old recent Oakland Athletics draft pick. As a collector of Rickey cards, it's harder to find something as cool as his first contract with the major card company in the industry. It looks to be a standard contract, probably offered to all new draftees, and even included a $75 bonus once he made a major league roster. The contract itself just sold for more than ten times that ($860.01 to be exact). Rickey was drafted by the A's on June 9th, 1976, with the 96th and final pick in the 4th round of the amateur draft. He signed with the A's a month later (on July 9th), and signed his contract with Topps the next week, on July 16th. It has to be one of his earliest signatures as a professional athlete, and as would be expected, doesn't look at all like the signature he would use during the majority of his playing days. I'm not sure who won the auction, but I hope it went to a good home! Here's a great video from the recent TriStar National Sports Collectors Convention. ESPN reporter Michele Steele asks Rickey about his dealing with the memorabilia industry over the years, which leads to the discussion of some of the weirder things that he has signed over the years (ie construction helmets, bras, and bullets). She also asks him why he won't sign bases, which is a questions that I am frequently asked as well. Enjoy! One of the great things about having a website like this is that other Rickey collectors send you pictures of some of their favorite and unique items, which can then be shared with other fans who may have never even known that they existed. Everyone knows about Rickey's hard to find 1977 Chong Modesto A's Minor League card, and about a year ago a sticker from his time with the 1978-79 Mexican Pacific League was discovered. But, Rickey's first "card" may be this postcard produced for the 1976 Calfornia High School North/South All-Star Game. Following the high school season, Rickey was selected as a member of the North squad, which met up in Anaheim to play the team from the South. 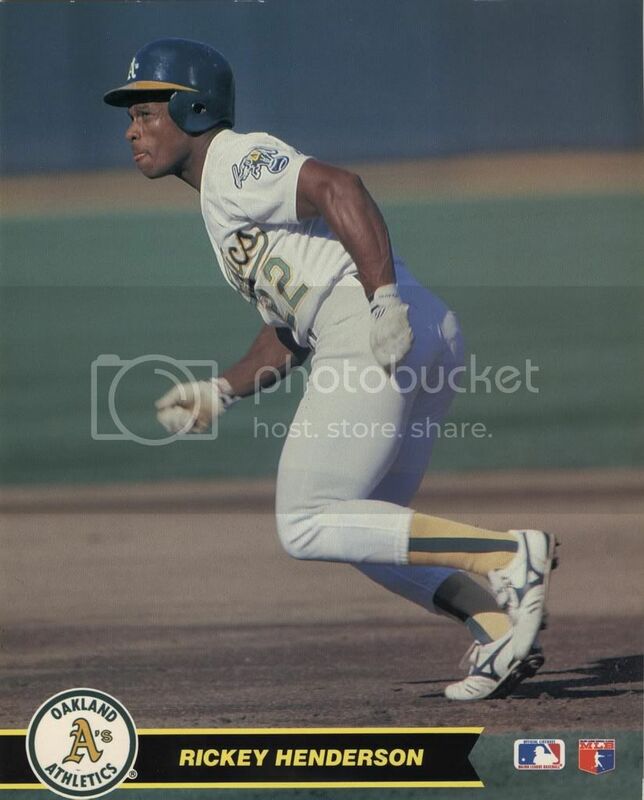 Looks like Rickey was wearing #22, which he also wore for a couple of games with the A's when he was traded back from the Yankees in the middle of the 1989 season. 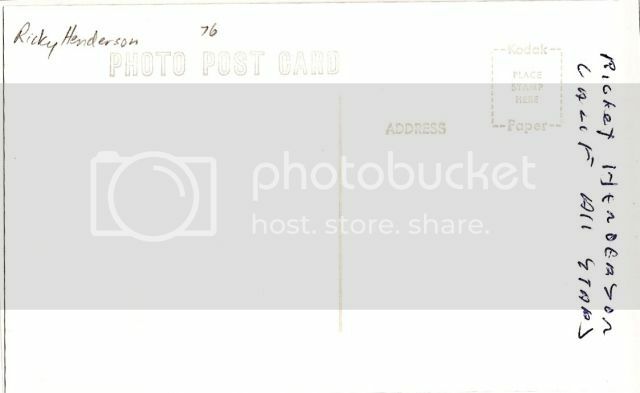 The "photo post cards" are identified on the back by what looks like two different individuals (one in pen, the other in pencil). One states "Rickey Henderson, Calif All Stars," while the other just says "Ricky Henderson 76." I'm actually surprised that his name was spelled right once, as it's almost always misspelled "Ricky" in his early memorabilia. Rickey wasn't the only future all-star who played in the game, as it also included a young Alan Trammell. Trammell actually commented on the game in an ESPN article from around the time of Rickey's Hall of Fame induction, one of the only mentions of the game that I was actually able to find. It's funny how baseball keeps bringing him back full circle. 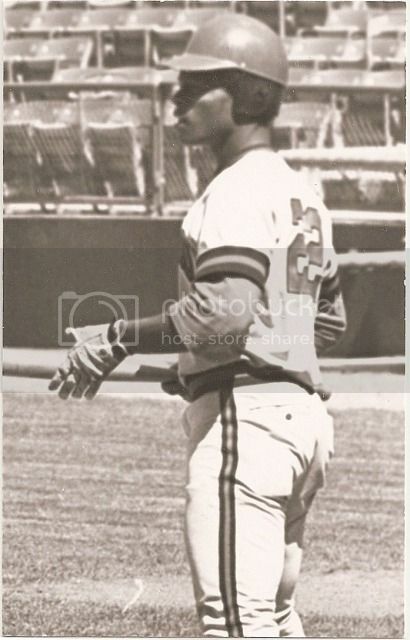 In the summer of 1976, Henderson played in a California high school All-Star Game in Anaheim. 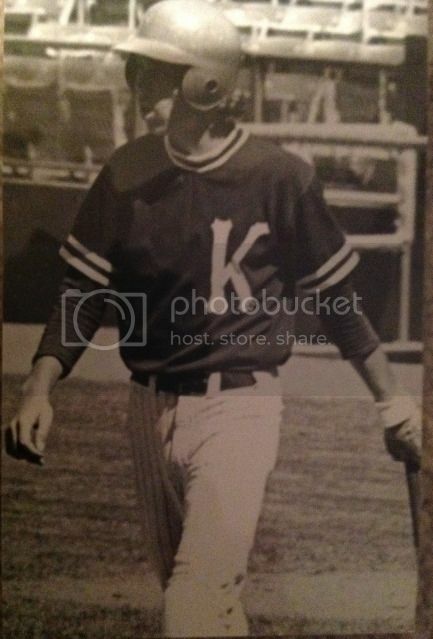 He was part of the North team roster, and the South squad featured a talented young shortstop named Alan Trammell. "He led off the game with a double," Trammell said. "We had a scouting report on Rickey, so on the first pitch we did an inside move and picked him off second." In 2001, Trammell was a coach in San Diego, and Henderson notched career hit No. 3,000 with the Padres that season. In their limited time together, Trammell saw a side of Rickey that he never could have discerned from crowding the second base bag. "He never complained once when he didn't play, and the young players loved him," Trammell said. "He was just a regular guy there. I saw that firsthand." Listed below are the remaining players in the 32 card set. As far as I know, this is the only set that has surfaced, as I don't know of any other collectors that have one. I doubt that many of these were purchased (apart from by the players parents), and there's a pretty good chance that none of them were actually mailed. Who knows how many of these were produced, but there are probably only a handful in existence. I wasn't able to find out much information about the game itself. You would think that the archives of the LA Times of the Orange County Register might at least have a box score or a short mention, but I haven't been able to track one down. If anyone has any information about the postcards, or the game in general, I 'd definitely love to hear it!